Chances are, you have heard the phrase “going green”. It essentially means to actively make choices that are more environmentally friendly. As members of the green industry we have an obligation to do business in a green manner, from conservation projects to reducing pollution. Furthermore, taking steps within your business to be more green also has benefits that go beyond less pollution. 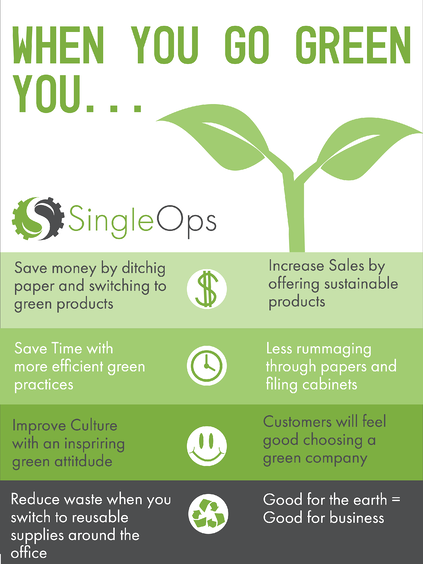 Learn more about how green solutions can improve your business. 1. Reduce Waste. First off, there are no rules to going green, every small step you take adds up in the long run to make a bigger impact. Simple changes around the office like switching to LED lights, stocking reusable cups and silverware in the break room, and keeping a recycling bin will reduce your company’s carbon footprint. Paper is one of the easiest things to cut back on through software and moving documents from the filing cabinet to the cloud. Eventually you may look into even bigger changes outside the office such as electric machinery and meeting with green vendors. Recycled materials such as plastic bender board and recycled mulch are actually less expensive and just as easy to install than their counterparts. 2. Improve Culture. Emphasizing the importance of the environment within your company will create a positive green culture among employees. Doing good for the earth makes you feel good. You may be surprised on the changes employees take upon themselves when they are encouraged to be environmentally conscious in the workplace. It is something everyone in the company can take pride in inside, and outside of the office. Try incorporating an environmental service project as part of a team outing. Check out the benefits of improving culture in this blog post! 3. Increase Sales. Customers will also feel good in choosing a company that cares about the earth. By choosing to offer more sustainable products, you can attract more customers who are concerned in leading a sustainable lifestyle themselves. The reality is, people do consider sustainable products when going into a market and are willing to pay more for it. 72% of Generation Z said they would be willing to pay more for services if they came from a sustainable company. 4. Save Time and Money. The advantages to ditching stacks of paper go beyond less waste and a clean desk. Choosing to implement a software is the solution to your paper related troubles. A software system allows you to automate tasks and find information at the click of a button. If you decide to go with a cloud based system, like SingleOps, then you will have access to that information anytime, anywhere, and on any device. If you're interested in learning more about the benefits of cloud technology check out this blog post! Considering the environment while running a business is the way of the future, it is sustainable both to the earth and to a company’s growth. Going Green is a great way to stay ahead of competition ; it could even be what makes your small company stand out in a saturated market. We would love to show you how a 100% paperless software can help your business be more green and run smarter in a FREE online demo. Schedule yours today! SingleOps is a cloud software product that integrates sales, back office, and the field – saving you time, growing your business, and making your team happier.